Layers of brownie and ice cream? Yes, please! This recipe incorporates our Brownie Batter Cookie Dough ice cream, a previous Limited Edition flavor that is now available year-round! Great for a birthday treat or just because, this dessert can make any moment special. 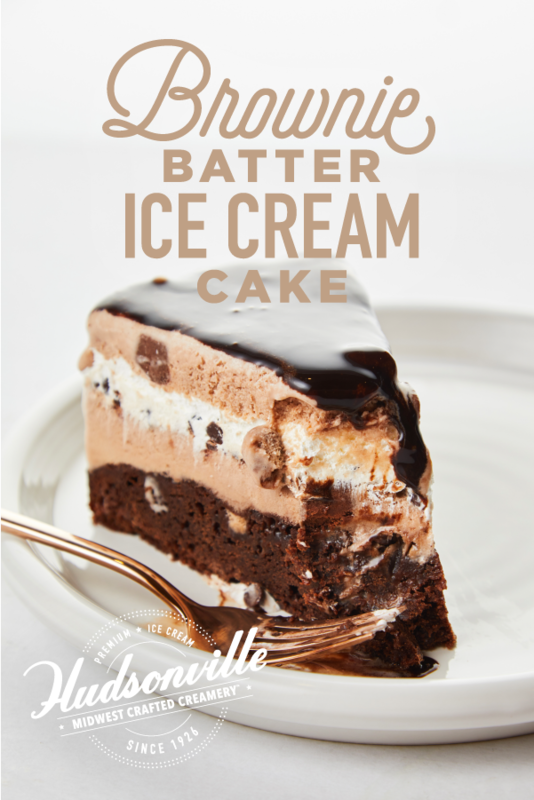 To create this Brownie Batter Ice Cream Cake recipe, simply follow the instructions below. Mix and bake brownie mix according to package directions in a greased springform pan. Cool thoroughly and spoon a layer of softened ice cream, followed by a layer of whipped topping and mini chocolate chips. Remove from freezer and repeat with a second layer of ice cream. Freeze for 4-6 hours or until solid and ready to serve. When ready to serve, remove sides of springform pan and place on serving platter. Heat hot fudge topping according to package directions and pour over cake. Cut into slices and top with additional whipped topping or nuts as desired! Show us how you’re enjoying this delicious treat by tagging us in your pictures on social media. Have a recipe of your own to share that uses Hudsonville Ice Cream? Send us a message and we might share yours next!